Since this weekend is the un-official start of summer and you might have a cook out or two in your weekend plans, I thought I’d share a delicious cocktail with you! If you follow me on social media, you may know I’ve been really hooked on Strawberry Basil Moscow Mules lately. I’ve been making them for everyone who has come to visit 😉 While they are super tasty and cold in a gorgeous copper mug, nothing beats a frozen cocktail in the summer! The other day I picked up a few pints of raspberry sorbet and thought I’d use it to make a quick and easy Frozen Raspberry Margarita. Margaritas are so flexible, there are so many combinations you can make with different flavors and serve blended and frozen or just on the rocks. I generally like to drink margarita’s on the rocks (with salt….always with salt 😉 ) but sometimes I want a refreshing blended drink and this was one of those days. 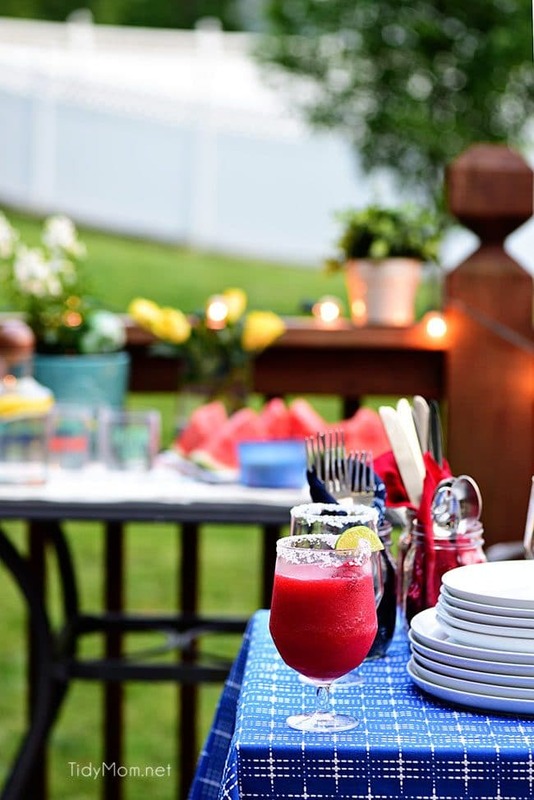 Summer evenings in the backyard are made for sipping cocktails with friends. Am I right?!! I just got back from a weekend in Sacramento with a small group of blogging friends. My friend Dorothy of Crazy for Crust was generous enough to open up her home to 13 of us. We had the most wonderful relaxing time hanging out at her house, talking video, learning/sharing all things blogging, cooking for each other (we made and served recipes from all the blogs) and enjoyed wine and cocktails. There was lots of laughing, hugging and bonding going on. I can’t tell you how important it is to have women who get what you do and are so generous with their knowledge and experience. Such a great reminder of how much we all need to connect IN PERSON in our life. and don’t just sit around waiting to be invited….make it happen! Make plans, for coffee or a whole weekend with a few friends…..get the ball rolling! You’ll be so glad you did!! 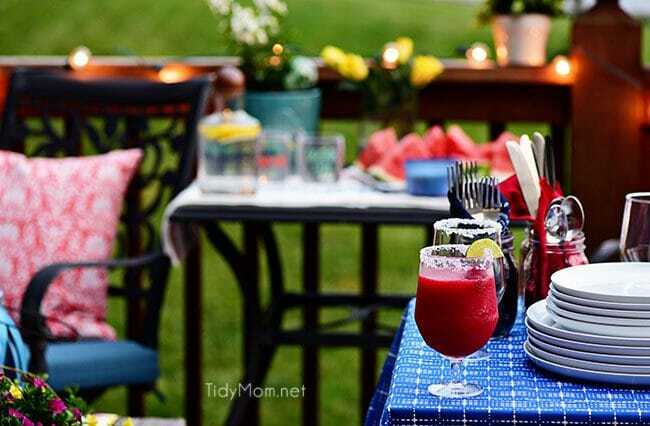 If you’re looking for something to serve your friends this summer, Frozen Raspberry Margaritas is sure to be a hit! 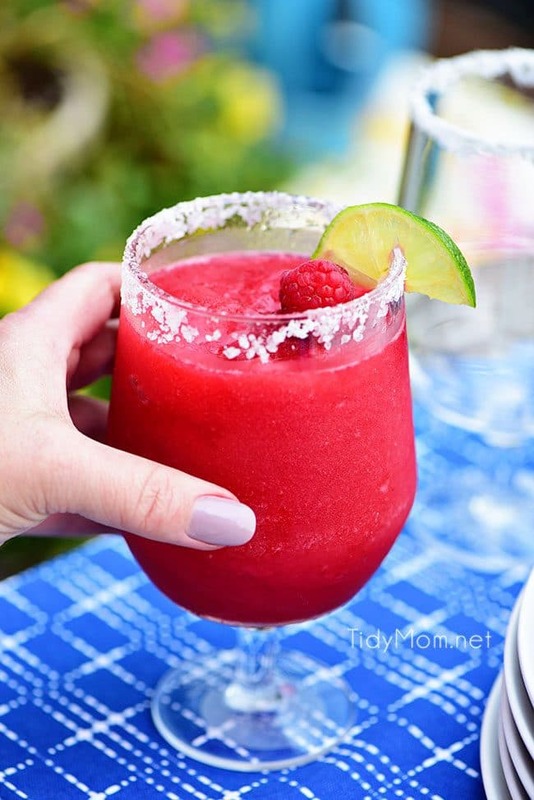 It doesn’t get any easier than tossing some raspberry sorbet, lime juice, tequila and ice in a blender! So delicious, they are almost creamy!! You could even toss in some frozen raspberries if you want. Looking for more drink recipes for this summer? 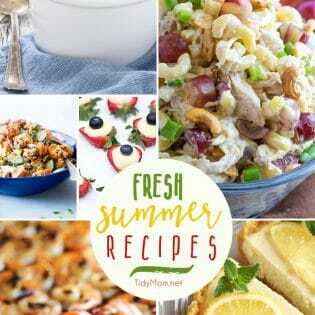 Check out these fabulous recipes from my friends that I spent the weekend with. 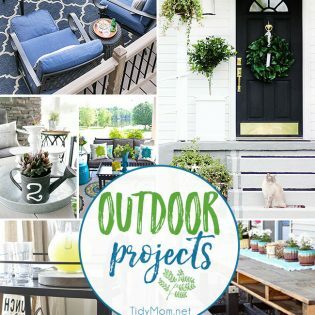 Click around on their sites, they are all incredibly talented! 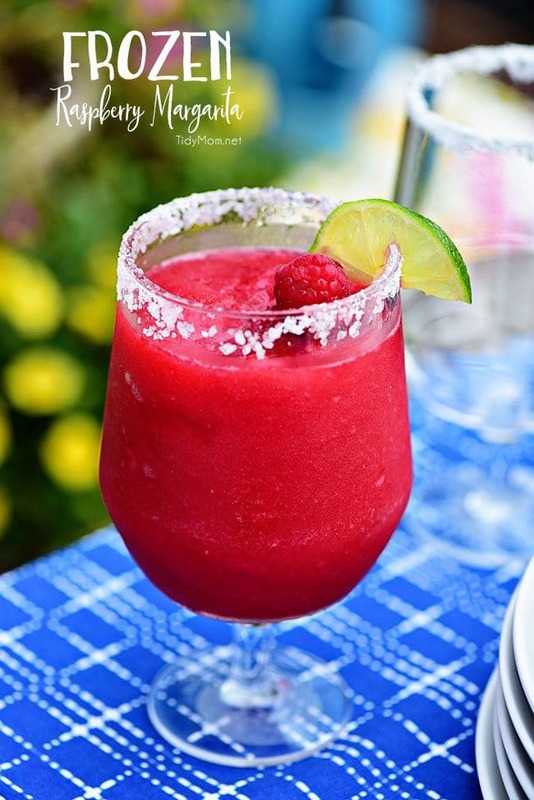 Like this Frozen Raspberry Margarita Recipe? Pin It! Garnish with a lime slice and a few fresh raspberries. Sip and enjoy! *this recipe only made 1-1.5 drinks when poured into a large wine glass, like i did. 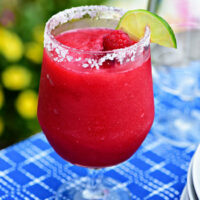 I’ve never made raspberry margaritas before and now I’m wondering why.This is just so delicious! I made some yesterday evening and me and my hubby loved it. It’s super tasty. Thank you for the instructions! This sounds perfectly refreshing — especially on a hot, muggy day! Love this and so will my li’l nugget. I’ll have to make a virgin batch just for her!